The Huskies put points on the board near the end of the first quarter with a drive that included a 69-yard pass from QB Tony Dawson to Wesley Lewis and a touchdown by running back Terrance Peters. On the next drive, ACU answered with a touchdown and two-point conversion, bringing the score to 8-7. Late in the second quarter, Dawson scored a touchdown pulling HBU ahead to 14-8. The ACU Wildcats managed a 42-yard field goal to end the half at a Husky lead of 14-11. Early in the third quarter, after a penalty, the Wildcats scored another field goal, tying the game at 14-14. Later in the quarter, HBU’s freshman Greg Vincent sacked the ACU quarterback on a third down, which forced an ACU punt. Dawson completed a 43-yard pass to H-back Mev Ajdin down to the 2-yard line. Then, running back Terrance Peters scored his second touchdown of the game to pull the Huskies ahead at a score of 21-14. With seven minutes left, the Wildcats tied the game at 21-21. ACU had a chance to pull ahead in the last few seconds of regulation, but the field goal was blocked by junior defensive end Taaron Timmons. On the opening possession of overtime, ACU made their third field goal of the night, pushing them ahead to 24-21. On the Huskies’ first play in overtime, senior quarterback Tony Dawson completed a 25-yard pass to wide receiver Wesley Lewis, effectively ending and winning the game. 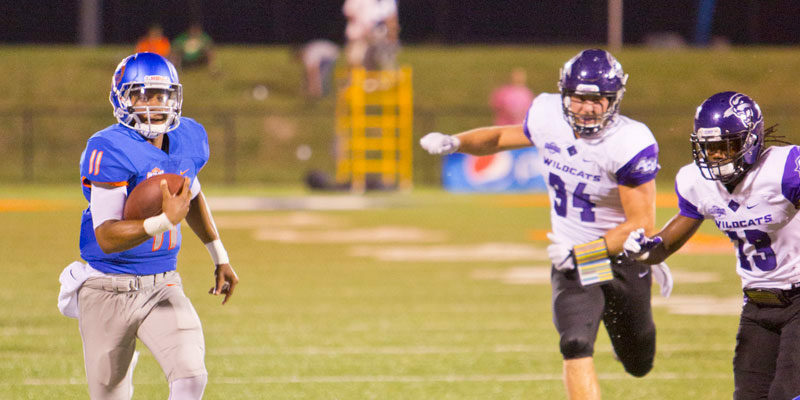 ACU had 515 yards of total offense compared to HBU’s 389. Neither team turned the ball over. The Wildcats committed 13 penalties for 90 yards while the Huskies committed only six for 45 yards. Vote for the game-winning play as the HERO Sports FCS Play of the Week! To read more about the game, visit the Husky Athletics website.